The Rye Tavern is located on a dirt road in the middle of nowhere. The sooner you get over that, and stop worrying about running out of gas or being eaten by bears, the better off you will be. The structure was built in 1797 and presumably at that time it was on a busy thoroughfare. Today, one dirt entrance takes you past the golf course community known as The Pinehills, and the other brings you in through bucolic horse farms. These are neighbors who think nothing of shelling out 45 bucks for a bottle of Cabernet, as the folks next to us at the bar did. That’s pretty pricey for us canines, but not inconsistent for the menu. That said, our total before tip, for two appetizers, two entrees, and a bottle of La Fiera Montepulciano ($25), came to just $91. Not bad for an excellent, ample dinner of fresh ingredients, as local as the bitter March winds would allow, prepared at the direction of an expert chef. We happened to be on duty for the first night of a new menu, and we had difficulty making choices. Our mild red wine arrived alongside a bread basket that the Big Dog thought was the highlight of the dinner — a sweet, cakelike cinnamon bread and an oatmeal bread that probably contained something like pumpkin. 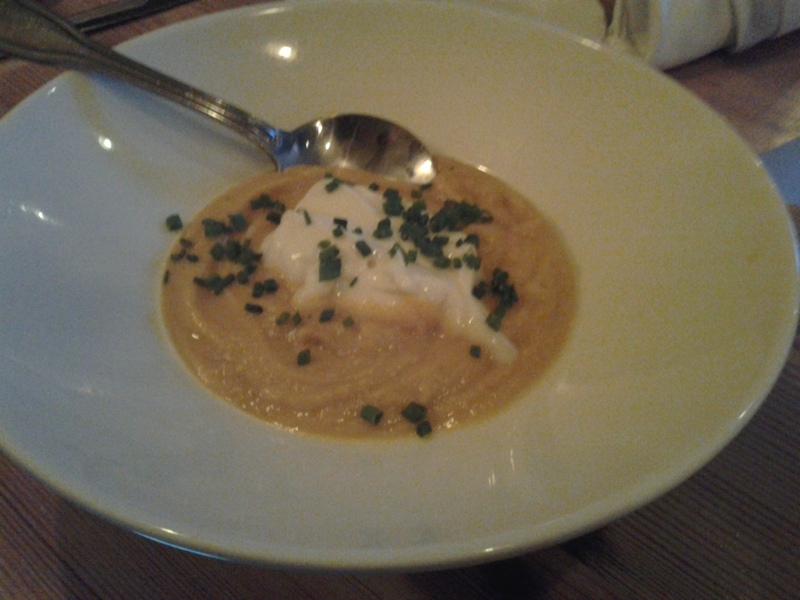 But surely the actual highlight was the carrot and ginger soup ($7) that the Dog ordered as an appetizer. Topped with a dollop of brie and sprinkled with chopped chives, the puree was thick enough to eat with a fork. The sweet carrots were edged out by the spicy ginger in a concoction that transcended the traditional combination. But no! The real highlight was Gina’s crispy brussels sprout appetizer ($6). Braised sprout leaves fluttered around a puddle of lemon aioli, anchored by meaty sprout halves and sprinkled with teeny candied sunflower seeds. Kathleen, our able bartender, said a previous seasonal menu had omitted the sprouts appetizer, and regulars were very unhappy. If our entree selections were any indication, Chef Joanna Farrar’s M.O. is to mix the vegetables and starch together, plate it over a ladle of sauce, position the protein on top, and garnish the dish with something interesting. For people who use a divided dish into adulthood, this is a disconcerting approach, but some of us like it. The Big Dog is on the fence about it, and this affected his view of dinner. He ordered scallops ($23). Five large scallops were seared to a mahogany color while maintaining their juicy interior. The ladle was a rich balsamic glaze. The veggie/starch mix was quinoa, tomatoes, and olives. The garnish was arrugula in a lemony dressing. Despite the Dog’s reservations about quinoa, apparently an acquired taste or texture, there was nothing left to bring home. Gina’s dish ($25) was a mix of couscous, mushrooms, and peas, topped by two generous and juicy slabs of swordfish, garnished with a bright salsa verde and a scoop of house-made ricotta. She ultimately agreed with the Dog that the combination of everything was overwhelming, but the Divided Dish gene she inherited, along with the ability to separate ingredients with a fork or knife, revealed the individual elements as delicious. Now, to offset our whining about the bumpy, bear-lined roads, we should mention one feature that will bring us back, and two others that are really cool. We will definitely find our way back to the Tavern to sit outside on the heated patio around a gas fire. The country setting and charming landscape would make this a great spot for outdoor dining or just a gruner veltliner on a summer night. A secondary feature is what they describe as a 2,100 square foot vegetable garden. And finally, imagine wending your way through a two-century-old tavern, complete with what appear to be original features, into a nicely appointed restrooms complete with wooden sinks. No kidding! They’re new, and they’re beautiful. Plymouth is full of odd antiquities, and here is one that is well off the beaten path — and well worth visiting. We envy the folks for whom this is a neighborhood tavern. This entry was posted on March 29, 2013, 7:37 am and is filed under Good Wine/Beer Selection, Outdoor Dining, Pub, Romantic Dining. You can follow any responses to this entry through RSS 2.0. You can leave a response, or trackback from your own site. I had a feeling you would have a favorable opinion of not only the “ambiance” but the food. We are looking forward to our next visit.